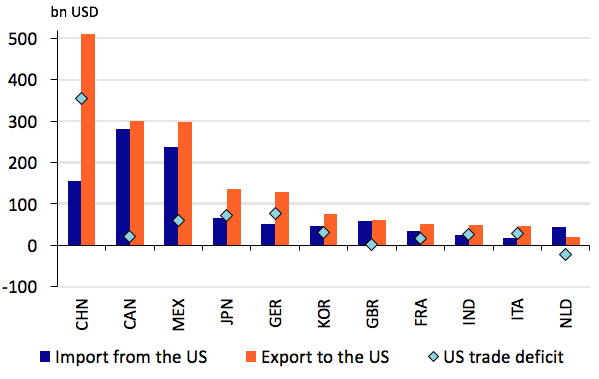 According to US President Donald Trump, the large trade deficit that the US runs with China, Mexico, and Germany illustrates dishonest trade practices by these countries (Figure 1). In order to bring back jobs to the US, Trump promised his voters to tear down NAFTA, and to introduce heavy import tariffs against China and Mexico. So far, the Trump administration has terminated negotiations on the Trans-Pacific Partnership (TPP) and announced a duty on Canadian softwood lumber. However, for the most part Trump seems to be backtracking on his initial promises. On 12 April, for instance, he stated that China is not a currency manipulator after all (Wall Street Journal 2017). On 27 April, the White House announced that it would renegotiate rather than terminate NAFTA. Here, we discuss the five reasons why Trump won’t resort to full-blown protectionism. First of all, there are the obvious political reasons to refrain from full-blown protectionism. The White House needs Chinese cooperation to put maximum pressure on Pyongyang in order to eliminate the North Korean nuclear threat. Moreover, the US is a member of the WTO, which uses a non-discriminatory clause, known as the most favoured nation (MFN) principle. This principle means that countries cannot randomly discriminate in trade policy between trading partners that are also members of the WTO. Therefore, the most favoured trade policy regime of the US, such as lower customs duties on certain products, should apply to all WTO members. In his 2017 Trade Agenda sent to Congress on 1 March (Office of the US Trade Representative 2017), Trump indicated that he is willing to violate WTO policies if he believes they support unfair trade practices. However, this could certainly trigger retaliation penalties against the US by other countries. The most important reason behind the US trade deficit has been credit-driven consumption growth by Americans households. Higher consumption has increased demand for Chinese goods. Subsequently, China used the incoming trade dollars to buy US assets, especially US Treasuries, which kept US interest rates low, propping up spending even more. 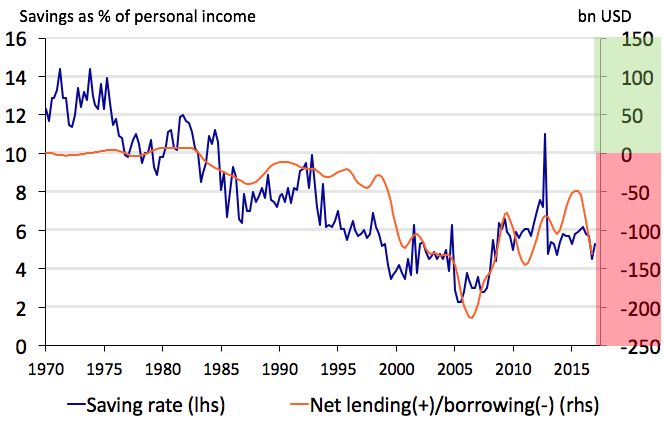 Simultaneously, US households saving rates have decreased substantially. Currently, US foreign borrowings range between $50-100 billion each quarter, needed to finance the current US deficit (Figure 2). Such imbalances are unsustainable in the long run. In the short run, however, the dependency on foreign capital inflows makes the US economy vulnerable, to say the least (Figure 3). A sudden stop of capital inflows could bring a major shock to the US economy. In many sectors, the value chain is sliced up globally. Therefore, US firms are highly dependent on imports of intermediate goods produced abroad, and vice versa. Gross export and import data do not show these interlinkages. Ultimately, disrupting US globally integrated supply chains – for instance via tariffs on imports – would not only hurt foreign exporters, but US firms and US consumers as well. 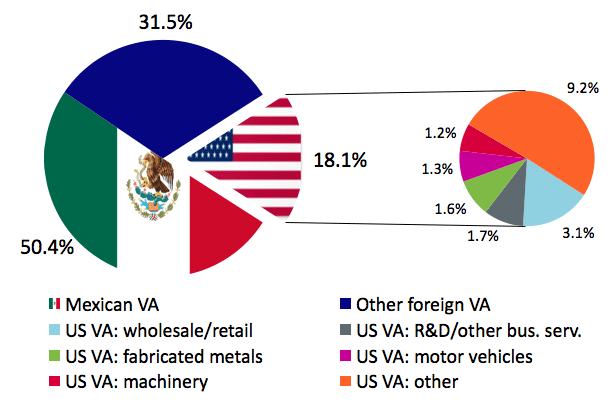 Erken and Tulen (2017) show that US value added in Mexican motor vehicle exports to the US is substantial (Figure 4). 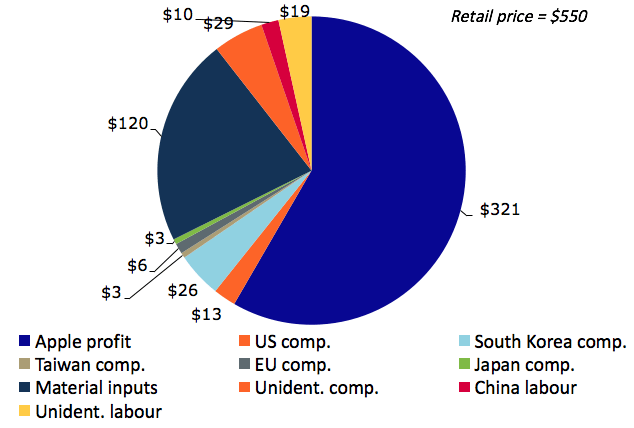 Reversely, US firms use foreign intermediates in their production process as well (Table 1). Disruption of these supply chains could be very costly for US manufacturers. Gawande et al. 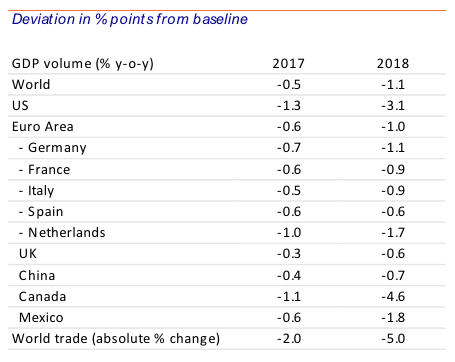 (2015) conclude that the increasing fragmentation of production across global value chains may have prevented countries from raising trade barriers and inducing protectionist measures in the follow-up of the Global Crisis of 2008. This might also explain why we haven’t seen any large-scale protectionist trade measures by Trump yet. Note: VA = value added. 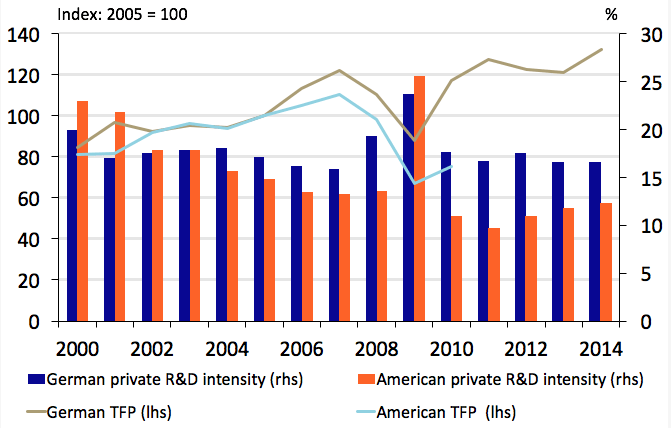 US companies benefit much more from offshore production than gross trade data show. In turn, these profits return to the US and are used to pay for high-wage jobs, such as marketing and product development. The share of the total revenue captured by the American mother company is significantly larger than the share earned by the assembling country abroad. Note: The iPhone shows no post retail, as Apple is directly paid by a cellular company, which handles distribution and sales. Even if large US corporates were to decide to relocate overseas manufacturing activities to the US, it is questionable whether this would translate into one-to-one job creation in the US. An important motivation for firms to re-shore production to the home base is automation, which has been eroding the labour cost advantage of low-wage emerging economies such as China. However, automation also implies that the capital-labour share of these production activities will shift (OECD 2015), which weighs on the employment gains of reshoring. Trump has been targeting trade as the culprit behind American job losses.2 But he has been ignoring one big elephant in the room – automation has also been an important reason why US jobs have been shredded. Declining costs of ICT and rapidly increasing processing power have increased the options for automating cognitive-routine tasks. Empirical research shows that automation might be far more important in explaining US job losses than trade. The bottom line is that Trump can impose trade barriers, but he cannot reverse technological progress. In order to foster job growth, Trump should instead focus on fostering domestic innovation and human capital. That way, he could boost US total factor productivity growth and revitalise the competitiveness of US manufacturing. In this sense, German Foreign Minister Gabriel Sigmar had a case in point, stating that Trump should not focus on raising import barriers on German cars sold in the US, but rather should pay attention to building better US cars (Figure 6). We have outlined five reasons why we believe President Trump will not resort to fully fledged protectionism. However, he also continues to face setbacks with his domestic policy agenda, such as the Senate’s rejection of repealing and replacing Obamacare. These defeats on the home front might induce Trump to take steps to implement his protectionist agenda, even against economic rationale. The question is what would be the economic impact of such a package on the US and world economies. To answer this question, we used the macro-econometric trade model NiGEM to run two scenarios. In the first scenario, we assume Trump decides to impose an additional uniform import tariff of 20% on all US imports. In the second scenario, we rerun the first scenario, but assume that foreign countries will retaliate by imposing an additional tariff 20% on all imports from the US. The results of scenario 1 are illustrated in Table 2, which shows the effects in percentage points vis-à-vis our baseline scenario. The results show that the US economy would grow by 1.4% less in 2018 than our baseline (2.4%). The 20% additional tariff leads to higher import prices, and therefore higher US inflation. This will also result in higher export prices, lower private consumption, lower investment, and lower export and import growth. On top of that, higher inflation feeds into higher interest rates. Higher inflation will force the Fed to hike its monetary policy rate to stem inflation.3 Higher interest rates will further discourage private consumption borrowings and investment. Our scenario also shows that higher interest rates increase demand for dollar assets. Consequently, the US dollar appreciates, slightly lowering the negative impact of the import tariffs, but further lowering global demand for US products. In the rest of the world we see negative effects of US protectionist trade measures. First, export growth in other countries slows, which also feeds into lower investment, employment, and consumption growth. As lower growth in the rest of the world also lowers import demand in the rest of the world, the US economy takes another hit in the second round. 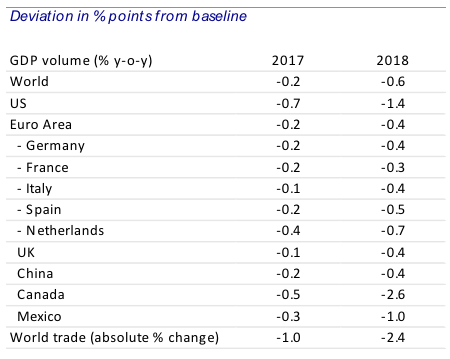 Of course, small open countries like the Netherlands and countries that have the strongest trade ties with the US, like Canada and Mexico, are hit relatively hard. In scenario 1, we have only imposed an additional import tariff in the US. 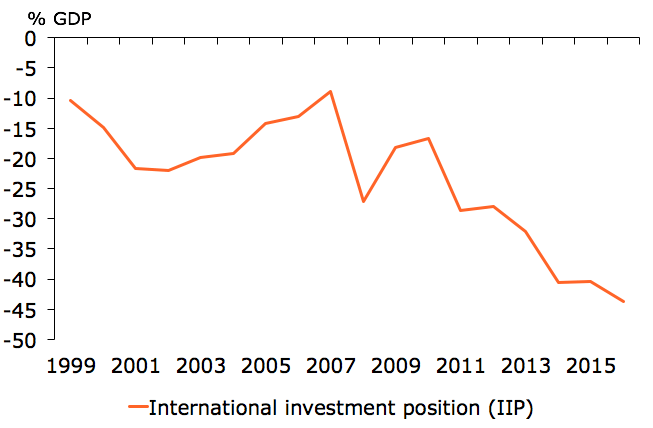 But protectionist measures rarely stay unanswered and countries tend to retaliate. Therefore, in a second scenario, US trading partners respond to the 20% US tariff by imposing a similar 20% on products and services shipped from the US to these countries (in the fourth quarter of 2017). Table 3 shows the results. In this scenario, the impact on US GDP could be as large as 3%, which means that the US economy would end up in a recession. The difference from scenario 1 is that the US faces a higher import tariff by all of its trading partners, while the other countries are only confronted with an additional tariff in the US. Accordingly, the negative impact on economic growth in the US is larger than in most other countries. We have discussed several reasons why we believe President Trump is unlikely to unleash a fully-fledged protectionist trade agenda. The most important reasons are political ties, membership of the WTO, the possibility and the cost of retaliation, the existence of global value chain integration and revenue streams, and the fact that automation rather than trade has caused most job losses in the US. That said, all of these reasons are based on economic rationale. If Trump does resort to protectionism, and other countries retaliate, US GDP could face cumulative losses of up to -4.5% over two years. Acemoglu, D, D H Autor, D Dorn, G H Hanson, and B Price (2016), “Import competition and the great US employment sag of the 2000s”, Journal of Labor Economics, 34 (S1), S141-S198. Ebenstein, A, A Harrison, M McMillan, and S Phillips (2014), “Estimating the impact of trade and offshoring on American workers using the current population surveys”, Review of Economics and Statistics, 96 (4), 581-595. Erken, H, and M Tulen (2017), “US global value chain integration: a major impediment for Trump’s protectionist trade agenda”, Rabobank, Utrecht. Gawande, K, B Hoekman, and Y Cui (2014), “Global supply chains and trade policy responses to the 2008 crisis”, World Bank Economic Review, 29 (1), 102-128. Kraemer, K, G Linden, and L Dedrick, (2011) “Capturing value in global networks: Apple’s iPad and iPhone”, UC Berkeley and Syracuse working paper. OECD (2015), “Reshoring: myth or reality?”, OECD Science, Technology and Industry Policy Papers, no. 27, Paris. Office of the United States Trade Representative (2017), “2017 Trade Policy Agenda and 2016 Annual Report”. Wall Street Journal (2017), “Trump Says Dollar ‘Getting Too Strong,’ Won’t Label China a Currency Manipulator”, 12 April. Conference Board data shows that the average hourly wage costs in the US ($36) outnumbers the Chinese costs ($4) by almost a factor 10. Partly, this claim is backed by the empirical literature (Acemoglu et al. 2016 and Ebenstein et al. 2014). Of course, the Fed would take into account the fact that it is dealing with cost-push inflation and not demand-pull inflation. As such, in order to prevent significant damage to the economy, the Fed will calibrate its policy rate on nominal GDP developments (nominal GDP targeting) instead of the usual mix of nominal GDP and inflation (Taylor rule).